Like any housing crisis in history, we attempt to build our way out of it. It’s never been done successfully. Nonetheless, amidst a 40% price increase over the past two years, Vancouver is undergoing a massive boom in housing that will go down in the record books. A boom that has kept the BC economy propelling forward. Residential construction now equates for 7% of Canada’s entire GDP. More than the United States in 2007. Now that 2016 has come to an end, the final numbers are out. 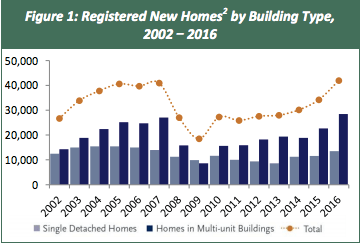 BC and Metro Vancouver both set new records for housing starts (when a project begins construction) and for new homes registered (when the building completes). Let’s break down the BC numbers. The province of BC had a total of 41,843 new units started in 2016. That’s a staggering 46% more housing starts than the four year average of 28,580 units from 2012-2015. To add to this, new housing completions were also well above average. In 2016, new housing completions were 30% above the 5 year average. Multi family completions were thrown up at an eye popping 32% above the 5 year average. New home completions in BC. So what about Metro Vancouver? Metro Vancouver saw 27,914 units started in 2016, 57% above the 10 year average. Further, only 19% of new housing starts were for single family homes. Interestingly, Per stats Canada, the average household consists of 2.5 people. Simple math shows we are building enough supply for 69,785 new households. Population growth is only expected at 30,000 people per year. So are we building enough? You be the judge. One things for sure, a tsunami of new inventory lurks in the distance, and hopefully, affordability.